Can the Corp use the ability on Whampoa Reclamation to add the card used to pay for the ability to the bottom of R&D? 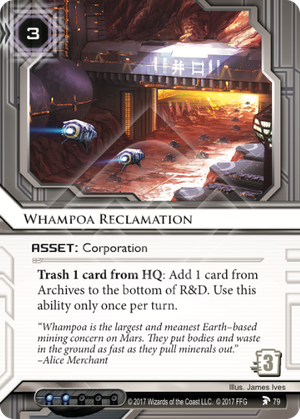 Can the Corp use Whampoa Reclamation while there are no cards in Archives? No. The effect of the ability does not have the potential to change the game state. Useful at any time: Jackson Howard doesn't work during a Legwork run. Whampoa Reclamation can quickly trash your agenda to prevent it from being stolen. Is Neutral, can trigger Indian Union Stock Exchange. Discards that Vanilla you don't need to recycle that trashed BOOM! Get one less use, assuming you do it on your turn and the runners. Only filters 2 cards. The extra influence is probably the most painful thing, but I feel the corps will adapt. I don't think this is the "true" Jackson replacement, I think Preemptive Action edges this out, but it can be a nice support for other "Half Jacksons" we've been getting, like Alexa Belsky, Special Report, etc.